Known as a chemical manufacturing by-product of many cosmetics and home cleaning products, the industrial solvent 1,4-Dioxane is now considered by the Environmental Protection Agency to be an "emerging contaminant" and "likely human carcinogen" that can be found at thousands of groundwater sites nationally—potentially representing a multi-billion dollar environmental remediation challenge. However, it is the contaminant's frequent co-existence with another toxic chemical—1,1-Dichloroethylene (1,1-DCE)—that has been found to aid in 1,4-dioxane's resistance to certain remediation strategies, including degradation by naturally-occurring microbes. Now, New Jersey Institute of Technology (NJIT) researchers have detailed the discovery of the first bacterium known capable of simultaneously degrading the pair of chemical contaminants—1,4-Dioxane and 1,1-DCE. The study, published in Environmental Science & Technology Letters, also showcases the efficiency of the microbe, called Azoarcus sp. DD4 (DD4), in reducing 1,4-dioxane and 1,1-DCE levels in co-contaminated groundwater samples. "Nationwide, researchers have found that more than 80% of the groundwater sites contaminated with 1,4-dioxane also contain 1,1-DCE," said Mengyan Li, assistant professor of chemistry and environmental science at NJIT. "This pair of chemicals are toxic and costly to remove from the environment because the pair have very different properties that typically require separate treatment solutions. Biodegradation by DD4 is the first biological method we have found for treating both compounds concurrently, and it is also environmentally-friendly and cost-efficient." Li's research team initially discovered the DD4 microbe from activated sludge samples collected from a municipal wastewater treatment facility. In the lab, Li's team was able to isolate and analyze DD4's ability to degrade 1,4-dioxane and 1,1-DCE simultaneously in contaminated groundwater samples over a two-week period. Applying the microbe to the field samples, Li's team observed that concentration of 1,4-dioxane was degraded from 10 parts-per-million (10 ppm)—or 3,000 times the limit of the EPA's guidance level of 0.35 parts-per-billion (0.35 ppb)—to under 0.38 ppb. The lab also found 1,1-DCE concentration levels reduced from over 3 ppm to below 0.02 ppm. Notably, DD4 displayed resistance to cellular toxicity produced by the metabolites of 1,1-DCE, which typically inhibit the ability of other bacteria capable of degrading 1,4-dioxane. Li's team observed that although DD4 was partially inhibited in its ability to degrade 1,4-dioxane when excessive amounts of 1,1-DCE were artificially spiked in the water samples, 1,4-dioxane degradation capability immediately recovered once the microbe had depleted 1,1-DCE. "Overall, we were impressed by the performance of DD4," said Li. "We did not add nutrients like ammonia for the microbe to feed on, or other facilitators that might enhance the bacterium's activity. 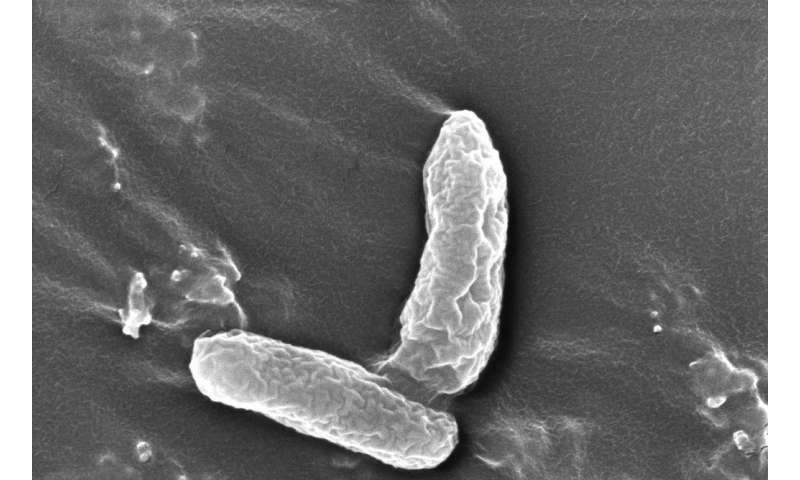 This demonstrated to us the potential of this bacterium for future use in the field." In an analysis of the genetic makeup of DD4, Li's lab identified a potentially key gene related to the microbe's chemical degradation activity. Li says that the gene encodes for an enzyme, called soluble di-iron monooxygenase (SDIMO), with versatile capabilities of breaking down chemical pollutants. "We want to characterize it (this enzyme) further to see if we can better learn the mechanism underlying how DD4 degrades these contaminants." said Li. Along with DD4's 1,1-DCE-resistance and ability to degrade the co-contaminants concurrently, Li says the bacterium possesses several other key traits that make it conducive as a potential bioremediation solution at contaminated groundwater sites—such as its ability to disperse freely through water to remediate larger areas of contamination, rather than aggregating like other bacterial treatments. The microbe can also be cultured rapidly and can sustain for extended periods with limited nutrient source. "We tested the bacterium in normal refrigerated temperature over three days and its viability remained above 80%," said Li. "After a week, half were still alive. This makes it even more desirable because it would be able to survive the delivery time from the lab to contaminated sites." Li's lab is now conducting further tests of the bacterium in the lab to better understand how DD4 might perform at contaminated water sites. With feasibility tests already underway, Li says his team could begin field demonstrations of DD4 as a water treatment solution for 1,4-dioxane and 1,1-DCE contamination sites as early as next year. "Ideally, we may inject the bacteria into the center of a contamination zone, or try growing them on the surface of bio-barriers that help stop spread of contamination," said Li. "First, we'd like to do more tests and possibly develop a gene marker that helps us assess the bacteria's performance. Then, we would like to move into the field."